Text on OTRCAT.com ©2001-2019 OTRCAT INC All Rights Reserved. Reproduction is prohibited. 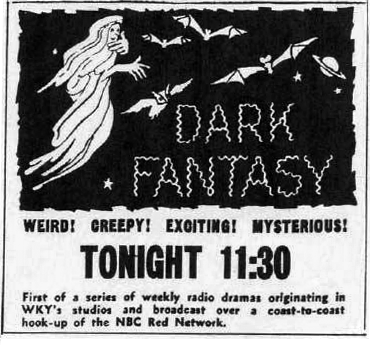 Dark Fantasy is and excellent old time radio horror and mystery program that was initially broadcast out of WKY, Oklahoma City. Dark Fantasy had more emphasis on horror rather than mystery but the shows also covered some science fiction and murder mysteries. 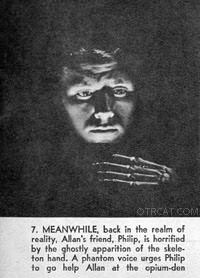 The show was so scary that it was broadcast in the on Friday nights when the nation's children were in bed. Dark Fantasy was the brainchild of celebrated old time radio horror writer Scott Bishop. Bishop was also the creator of Mysterious Traveler and The Sealed Book—both excellent horror old time radio shows with lasting appeal. This series is not to be confused with the series, Dark Venture, Dark Fantasy was syndicated around the nation after just 8 weeks of local broadcasts. Scott Bishop continued to be the sole writer for Dark Fantasy creating every chilling episode. The announcer of Dark Fantasy was Keith Paynton. The show was quite popular but only remained on the air for one year. See also Escape, Inner Sanctum, Lights Out, Mystery in the Air, Suspense, The Whistler, and Weird Circle. Be the first to comment on "Dark Fantasy"
Email * Your email address will not be published. You have reached the maximum number of votes for a unregistered user. You have reached the maximum number to down votes in this page. MP3 CDs are delivered by mail. These archival quality MP3 CDs are playable in your computer and many MP3 player devices. MP3 downloads are available instantly after purchase!